Yesterday’s roasted broccoli and fennel soup turned out quite well. This dish is vegetarian and almost vegan, except for the parmesan sprinkled garnish. I’ve juxtaposed this news with a picture from our travels of the Colby Room. The Colby Room, at the Boston Science Museum is a re-creation of Col. Francis T. Colby’s den in Hamilton, Massachusetts. 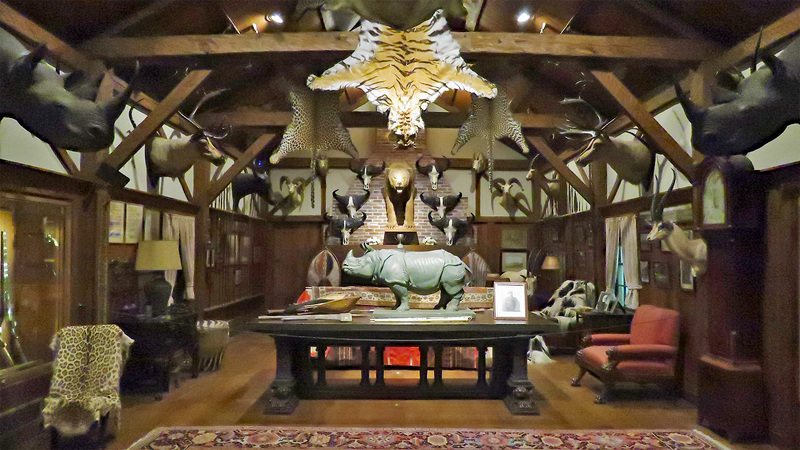 Like a snapshot in time, the room contains original artifacts and animals representing both the life travels of Colby and the mindset of his generation. Inside the room are pelts, mounted heads, horns, and antlers. African artwork adorns the walls and tables, while shields and spears frame the gigantic fireplace in the back. The side walls are lined with a collection of guns. These items were collected in the early 20th-century. Today, Colby represents a dangerous anachronism. A self-styled soldier of fortune, he is emblematic of a type of thinking that has almost faded from general acceptance, almost, but not quite. Many of the animals displayed are now near extinction, but most are still hunted. The environmental irreverence that was also birthed along with the industrial revolution of his generation has grown ever more dangerous. Manmade climate change now rockets us towards oblivion like a runaway train. Still, deniers question the evidence that is plain for all to see, as if humans too cannot be confined to the dustbin of history. We need to act on the issue of global warming, else ours will be the cooked goose. This entry was posted in Photography, Politics, Travel by RegenAxe. Bookmark the permalink. Sad about what humans are doing to the environment! Our home is geothermal and we recycle. We will be shopping for a new electric or hybrid car soon. Too many people just don’t care. We have an ’11 Prius. Its done well.